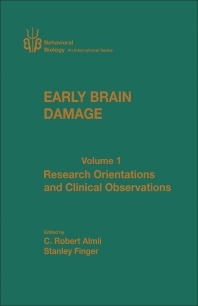 Early Brain Damage, Volume 1: Research Orientations and Clinical Observations, is the first of two volumes that provide a comprehensive overview of the many facets of research on the topic of brain damage sustained early in life. The present volume features a collection of chapters oriented toward early brain damage in human clinical populations. It is organized into four parts. Part I presents research strategies and theoretical issues, such as intermodal compensation and evolutionary considerations, relating to early brain-damage phenomena. Part II presents research on animal models of infant neuropathological conditions such as hypoxia, fetal radiation, locomotor hyperactivity, and attentional disorders. Part III is concerned with short-term and long-term neurological effects of brain damage in children, including chapters on perinatal asphyxia, behavioral consequences of cerebral insult sustained during infancy, and correlates of early generalized brain dysfunction in children. Part IV presents chapters on cerebral lateralization and higher-order functions as they are altered by early brain damage. This book was written for researchers and professionals interested in the topic of brain damage, and especially those interested in the developmental brain-damage issues emanating from laboratory animal studies and human case reports.